How to calculate Basic Pitch Time, UCL and LCL? Where, Basic minutes for the garment can be calculated using following formula. Generally an Operation Bulletin includes one column for calculated machine requirement and another column for actual machine requirement. Calculated machine, which is calculated requirement mostly come in fraction. See diagram-1. But in practical you can't assign fraction of a machine. Secondly you have to allocate correct number of machines to get output as per hourly target. Where work content is high (greater than Pitch) you plan for more that one machine for the same operation. When do you add one machine more and share work with other operation (machine) depends on work content and it is decided by Upper and Lower control limits. Upper limit is calculated by adding 10% to 15% of the basic pitch time and minus 10-15% to calculate lower limit. Standard limit is +/-10%. In the following diagram, UCL and LCL have been drawn considering +/- 15% of Pitch time. In the following diagram -2, Pitch diagram is drown with operation time, Pitch, UCL and LCL. Blue line shows basic time in seconds. When Blue line remain within UCL and LCL i.e. +/- 15% limit, one machine is considered for those operations. When basic time of an operation is above upper limit 2 machines will be assigned for that operation, e.g. attach sleeve, sew side seam with label and sew sleeve hem. How to Increase Efficiency of the Sewing Operators? 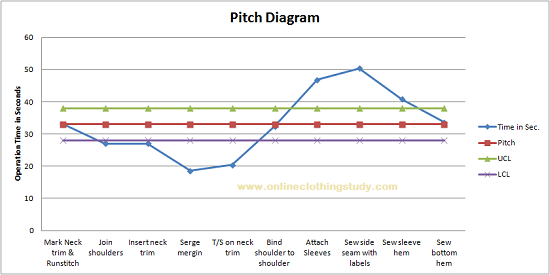 Online Clothing Study: How to calculate Basic Pitch Time, UCL and LCL?